DVI-Vision systems are available as CAT or Fiber variants. These differ by the used transmission cable between the CPU and CON module.The system consists of a computer module (transmitter) and a user module (receiver) and enables you to operate a computer on a local or remote console. DVI-Vision uses CAT-x cables or fibre optics to transmit signals up to 10,000 m. The devices use DVI video and are available as variants displaying 1, 2, 3 or 4 video channels. It is also possible to transmit transparent USB 2.0, RS232 and audio signals. 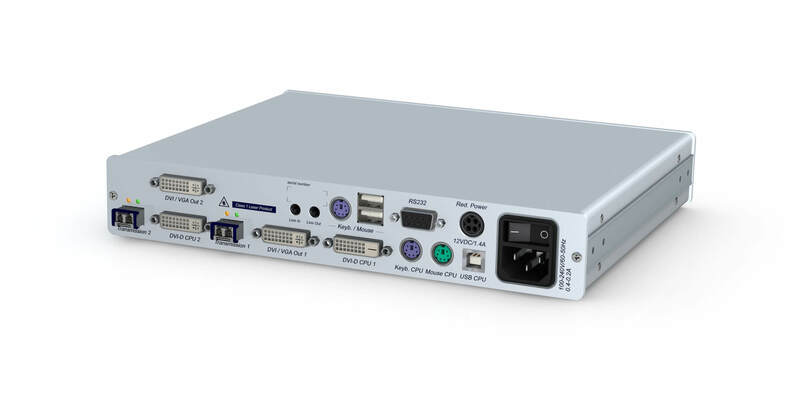 With its network port, the web interface and monitoring functions, the DVI-Vision system offers important features for mission-critical applications. requires a Transmitter Module to operate.